Bankrupt in the wake of the Civil War and faced with the difficult task of rebuilding and sustaining an infrastructure, Mississippi and other state governments turned to a familiar expedient to fund their penal institutions. In the late 1860s many southern prisons began leasing convicts to plantations and industries bereft of the cheap labor formerly supplied by slaves. As the majority of inmates were African American, this new form of compulsory labor helped to bridge the gap between the Black Codes and Jim Crow as a form of social control that embodied the common racial hierarchies in the South. Likewise, vagrancy laws criminalized the social mobility recently acquired by former slaves and produced a steady supply of bodies for the prison labor system. Although prisoners in the convict lease system were used for a variety of arduous tasks from railroad construction to cutting timber, inmates in Mississippi worked primarily on large cotton plantations. Edward Richardson, a plantation owner who had lost his fortune in the Civil War, was perhaps the state’s greatest beneficiary of prison labor. The first to have a convict contract with the state, officials paid Richardson eighteen thousand dollars a year for “care” of the prisoners. With the added income from the profits of their labor, he eventually regained his wealth, setting an inspiring precedent for the southern business community. After reaching its acme in the 1880s, the convict leasing era wound down as a consequence of accusations that too many affluent southerners had profited from the system and of moral indignation over the treatment of convicts. Inmates were forced to work dangerous jobs that free laborers refused to take and were subject to wanton physical punishment and severe deprivation, conditions that resulted in high death rates among the prison population. Outrage was further fueled by the fact that the state did not maintain separate facilities or mandate special treatment for children, and many were leased out under the system. Publicity regarding these deplorable realities led to a public outcry that forced Mississippi to abolish convict leasing in 1890, the first state to do so. 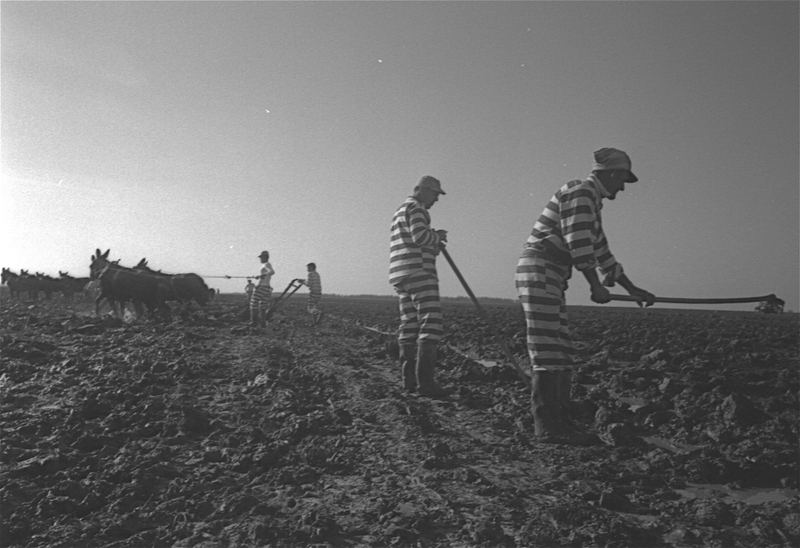 Individual counties, however, retained the right to use prison labor, and county-run chain gangs replaced convict labor in the early 1900s. Cuffed together at the ankle in small groups, prisoners were put to work expanding and repairing transportation routes as part of the Good Roads Movement, an urbanization effort aimed at increasing accessibility in the South. Though considered a troubling part of the past today, this use of convicts was generally championed in its time, and supporters, including the US Department of Agriculture, considered it an efficient and progressive way to both build roads and control criminals. As with the convict lease system, most of the chain gang laborers were African Americans, who were thought to require a generous measure of discipline for proper “rehabilitation.” But convicts on county-run chain gangs often slept in cages and were subject to brutal corporal punishment and suffered from a host of debilitating ailments, including malnutrition, heatstroke, frostbite, contagious diseases, and shackle poisoning (infections caused by the constant rubbing of iron against the skin). Work songs helped to sustain morale and increase chances of survival, allowing prisoners to labor in a steady rhythm that could be slowed to protect the infirm or inefficient. As with the convict lease system, mounting public outrage resulted in bans on chain gangs nationwide by the mid-twentieth century. Mississippi consolidated much of its convict labor force on Parchman Farm, a profitable and self-sustaining penal cotton plantation located on twenty thousand acres in the Yazoo Delta. Parchman was established in 1904 by Gov. James K. Vardaman, a proponent of prison reform who billed himself as a progressive and visionary but who regarded African Americans as mentally inferior and touted a paternalistic brand of racism that envisioned a pacified black population reconciled to subordinate social position.